Accounts are temporarily unavailable when cookies are corrupted. Thankfully this is a simple error to correct. What has actually happened here is that the cookie on your computer (a small file in a folder used by your web browser to keep information websites need in order to run properly) has become either corrupted or out of date. When things are running normally, the browser reads the cookie and sends data to the website, which the site then processes and sends you the data you expect to see (in this case, your Facebook news page). When it does work, the browser sends the wrong information and the website gets confused. The solution is to clear your browser’s cookies. This has the effect of logging you out of every website, so it’s best to make sure you have all your usernames and passwords written down before you do this. Once you have all the information you will need to get you back up and running, clear your cookies then go back to Facebook.com and log in again. 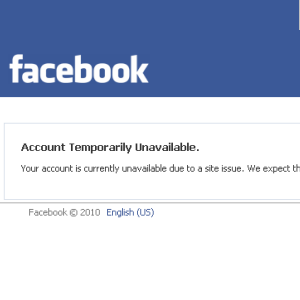 Hey presto, the “account temporarily unavailable” error will have cleared itself.